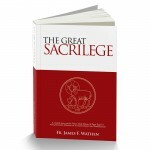 It is our pleasure to introduce the official blog of the James F. Wathen Traditional Catholic Foundation. Our hope is to use this blog to promote the continuing apostolate of Father Wathen by bringing to the foreground some of his most relevant and dynamic works, whether written or spoken, and also to deliver news on the Foundation itself. Moreover, we want to provide an answer to the question: “Who was Father James Wathen?” Of course, we could rattle off dates and places and provide a few biographical anecdotes, but really, a man is not defined as much by the places and circumstances he found himself in, but by the few moments in his life when he acted upon decisions that changed the course of his life, others’ lives, and, perhaps even history. 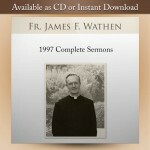 So who was Father James Wathen? Some say he was a champion of the Catholic Faith, a stalwart bastion of tradition in a Church riddled with modernism. Others contend he was merely a renegade, a religious ‘luddite,’ who resisted the normal course of change and became a thorn in the side of “progressive religion.” Surely, no cleric in the Unites States has rocked the post-conciliar world as much as this one priest. No doubt he had enemies, even within traditionalist circles. So as to not be accountable to the fallacy of arguing out of convenience, we will refrain from answering our own question. We leave it to you to decide. That said, we feel the best way to get acquainted with Father James Wathen is to let the good padre speak for himself. To that end, I hope you will indulge us in the happy expectation of many future posts, where we will hope to form a clear view of Father James Wathen, man and priest.